Ingrid Matthews analyses PM Scott Morrison's spectacularly ill-conceived plan to move the Australian Embassy in Israel to Jerusalem. THERE WAS NO ISSUE until there was, and there is no question that Scott Morrison heard what he wanted to hear and did what he wanted to do. What the Australian Prime Minister heard and acted on, apparently, was advice from an ex-ambassador to Israel. Dave Sharma is billed by his colleagues as the best and brightest of Liberal Party recruits — an opinion duly amplified by major media outlets. Yet his advice was so spectacularly poorly conceived – or poorly received, or both – that a month later it is still the chemtrail of Australian politics — toxic nonsense, spun out of thin air. There is more backstory – there always is – but factional in-fighting already gets way more attention than it deserves. From where I sit, the entire caucus is a dud investment, costing the Australian public a fortune in salaries, and phone bills, and jet travel and pork for negative return to the national interest. Domestic politicking on Israel and Palestine is never a good idea. It inevitably stirs up anti-Arab and Islamaphobic feeling as well as anti-Semitism. It mobilises unhelpful interventions from people like former PM Malcolm Turnbull and former NSW Premier Bob Carr, who posture as experts on matters they failed to address when they had the power of political office to effect change. Legacy media then buy into this legacy protection racket and when these voices dominate debate, no real progress is ever made. Announcing a re-think on moving our embassy from Tel Aviv to Jerusalem is highly problematic and there is no excuse for a prime minister not knowing this. There is no excuse for Sharma either; his campaign to replace toppled Prime Minister Malcolm Turnbull relied heavily on that "former Israel ambassador" status. Most commentators noted that Wentworth has a significant Jewish bloc of around 12.5 per cent of voters; that strict adherents of Judaism would have cast pre-poll votes because Australian elections are held on Saturdays; and that Jews are not a homogenous group of one mind on Israel, or Palestine, or pro-Zionist policy settings. Oh, wait. Nobody mentioned Zionism. Nobody ever does. In 2013, I spent two days in al Quds Jerusalem. The only places I saw outside the Old City walls were transport interchanges between Ben Gurion Airport (where I was later detained at length for perceived Palestinian sympathies) and back to Jaffa Tel Aviv. These old cities are incredible, like Uluru is incredible. The antiquity sits in cellular memory, buried deep in blood and bone. I am not Arab or Jewish, or Christian, or Muslim, or Armenian, or Greek (Old City's quarters). The closest my forebears come to an ancestral connection is stirring renditions of the eponymous – and fictional, the English are good at that – hymn Jerusalem. I also have the same bodily response to both bagpipes and yidaki didgeridoo. Maybe I just feel sites and sounds, the way some people see auras. Or lessons learnt from Aboriginal friends and family, scholars and tour guides, are universal — listening to country, wherever I am, whosever country I walk on. Either way, my politics are grounded in universality and not in exceptionalism or nationalism. These ideologies illuminate the embassy issue that wasn’t — until it was. The Zionist vision is of an eternal, undivided "capital" of Eretz Israel. There is no place here for a shared capital, nor for self-determination of Palestinian people living under military occupation. The Netanyahu speech puts the lie to our prime minister’s claim that his embassy announcement supports two states. Israel is already a state, so two states necessarily mean a sovereign Palestine. An eternal undivided capital of a Jewish state and the international two-state 'solution' consensus are mutually exclusive. This biblical imagery [full English text here] is designed to flatter belligerents like Donald Trump and, presumably, Scott Morrison. Our Prime Minister is ignorant, or lying, or both; and Australian Government ministers are now doubling down on his incoherent line of argument, in pursuit of factional enmities and with complete contempt for voters. There is no real way of knowing if Scott Morrison understands the implications of his announcement. The more he blathers about listening and hearing, the more you suspect he is incapable of either. Perhaps Morrison is a committed Christian Zionist who is across all the politics of an "eternal undivided" capital. Most Christian Zionists are from the same kind of Pentecostal sect to which Morrison belongs. Alternatively, all politics is local. Maybe Morrison was driven by the Wentworth by-election. Major media outlets reported this retail "angle" but mostly failed to interrogate the core illegitimacy: mobilising foreign policy for domestic political purposes. This is not unusual. 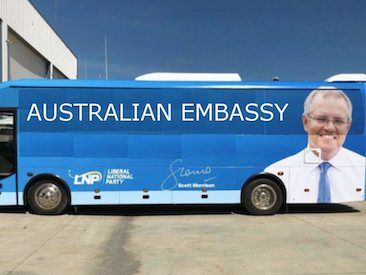 When the Prime Minister boarded a big blue bus to tour marginal Queensland seats without calling an election, the political press explained this was because the Government is threatened in marginal Queensland seats. We know this already. What we need the press to do is what we cannot: directly question the legitimacy of a politician using government power and public money – the political economy of conservative incumbency – to solicit party donations and splash the pork about. Similarly, many predicted that the embassy announcement would jeopardise bilateral relations with Indonesia. This is their job, but "foreign affairs" are often considered a holy grail of journalistic mastery. (Sheridan at The Australian is incapable of speaking without mentioning this vanity). For instance, the foreign affairs "inexperience" of Barack Obama and Julia Gillard consumed many column inches, yet the obvious ineptitude of men like Trump and Morrison barely rated a mention when needed. Then there were the leaked ASIO memos showing that Morrison failed to consult security agencies, Senate Estimates showing Morrison did not work with diplomats or the Foreign Affairs Minister, and revelations that military chiefs found out after media briefings. The claim here is that anything Israel may increase the risk of terror attacks. This is important because actuarial pseudo-science of risk predictors funnels billions of dollars to the military and security agencies. It also relies on the false assumption that Palestinians (read, Arabs) are inherently violent. Palestinians are no more violent or non-violent than any group — there is no violence gene. The thinking is bio-essentialist nonsense and anyone amplifying such ugly untruths should be ashamed. The predictable post-U.N. vote attacks by Israel on Gaza were apparently not predicted by Sharma, who unconvincingly told Australian media and Wentworth that our Government's embassy announcement was in anticipation of the G77 vote. This is straight up hasbara, which would please only Zionists, who would have voted for him anyway. This is the one piece of advice on the public record that he offered to a sitting Prime Minister – the first Pentecostal one – during a by-election he was contesting. But this is not about ambassadorial credentials, or capacity to raise funds for the Liberal Party. It is personal, because religion is personal because ideology is personal because homelands are personal. That the policy and rationale and politics are all wrong, an avoidable disaster is obvious. From the leaked texts between Indonesian and Australian Foreign Ministers Marsudi and Payne to the deployment of Turnbull – by Morrison – to smooth over the mess at an oceans conference in Bali, it was always going to blow up in their faces. When Morrison shouted across the despatch box at former Attorney General Mark Dreyfus QC that Sharma knows more about Israel than anyone on the Opposition benches, it was personal. When Treasurer Josh Frydenberg went on the record to state the anti-Semitic record of Malaysian Prime Minister Mahathir Mohamad, it was personal. Major media do not note Frydenberg’s ethno-religious identity in every report, as is done when Indigenous people speak on Indigenous policy, or feminists speak to reproductive rights. This erasure of inherent biases is privilege. No Arab, no Muslim, no Palestinian gets to speak on "the Middle East" without being labelled. Not-labelling Frydenberg is neutralising, just as labels like "Aboriginal" or "feminist" or "Arab" invite audiences to dismiss expert points of view and lived experience. Meanwhile, the Israeli Defence Forces terrorise Palestinian people on a mass scale every day and nobody highlights whether Jerusalem-based correspondents are Jewish, or the New York Times Jerusalem bureau chief’s son joined the IDF. Frydenberg is the first Jewish Liberal Party MP in the House of Representatives, which tells us that the Liberal Party did not pre-select a Jewish candidate in a winnable seat until June 2009. I do not much like saying these things, because of the genie-in-the-bottle effect. I will say this: what Frydenberg is doing cannot and will not help his people. It is not possible to put Israel Palestine into public debate without producing intractable hostility and increasing anti-Semitism. Political journalists are alert to this inevitability, yet remain compelled to report on Morrison – he is the Prime Minister – and to a lesser extent, on Treasurer Frydenberg and Defence Minister Pyne (but not backbench bickering, "reported" by the Australian Financial Review). Foreign Minister Payne, a woman, is not bickering on the record. As Dr Na’ama Carlin explains here, the embassy announcement was a stunt from day one. It was an insult to Jewish communities, a simplistic and offensive presumption that Jewish Australians are single-issue voters. Not all Jews are Zionists and not all Zionists are Jews. At a 2014 march for Gaza in Sydney, I was standing next to a woman and boy who I supposed to be a mother and son (he was 13 or 14, the same age as my younger son). A group nearby unfurled a banner 'Jews Against The Occupation'. She asked (I think, in Arabic), "They are Jews?" The boy replied in English, "They are Jews but they are not Zionists". I tell this story because that young person had a better grasp of Israel and Palestine than can be detected from the public pronouncements of the Australian Government, from the collective wisdom of the Parliamentary Press, and the advice of a former Australian Ambassador to Israel and Liberal Party candidate to an openly Pentecostal Prime Minister. Ingrid Matthews is a sessional academic who teaches law and human rights. You can follow Ingrid on Twitter at @iMusing or via her blog, oecomuse.